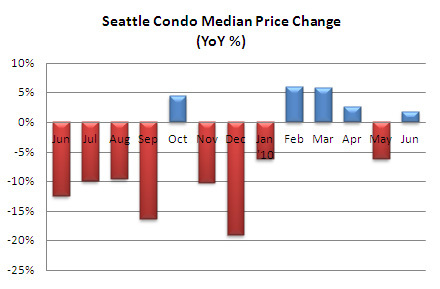 Seattle’s median condo price remained steady in June, unchanged from May at $285,000, which also equated to a slight 1.8% year-over-year bump over June of last year. Though, most neighborhoods saw value declines, particularly Downtown/Belltown which saw values dip 21% compared to last June. 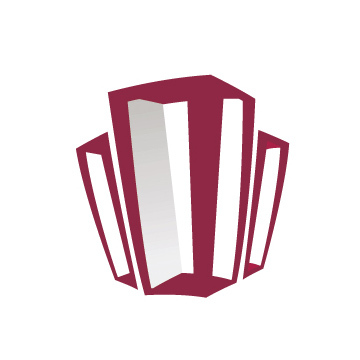 The number of pending transactions (under contract but not yet closed) and closed sales resulted in a one-month increase of 4.5% and 7.1%, respectively. 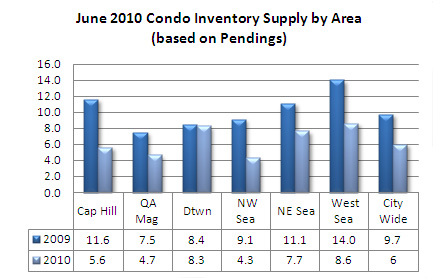 Compared to last June, the number of pendings were down 30% while closed units increased 11.1%. However, quite a number of June closings were residual pendings from April’s tax credit deadline. 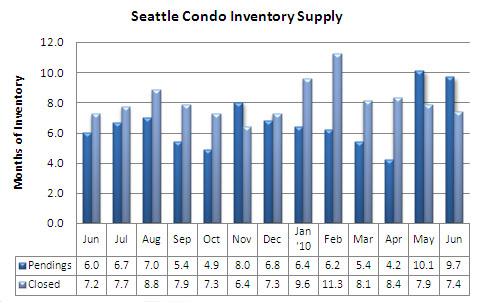 The inventory supply rate did level off a bit last month, however market conditions still reflect a buyers market. The number of active condo listings continued to rise, up to 1,564 units last month, nearing the peak levels back in the Summer of 2008. If I’m correct, June reflected the 3rd highest monthly active listings count on record. That, poses a concern going forward. Although it appears we’ve reached a pricing plateau over the past 5 months and we’ve seen fairly decent results with the number of pending and closed transactions, comparatively…the high inventory level combined with slowing sales activity will likely result in value erosion. 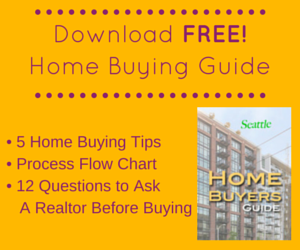 There are many buyers out there, no doubt. But, they have the luxury of selection, continued low interest rates (the rate hike that has been predicted has yet to materialize) and time. I don’t believe we’ll see the level of sales activity that we did in the Spring fueled by the tax credit urgency, where one in five listings sold. Currently, about one in every ten listings is selling. Therefore, I suspect values will fluctuate (trend downward) as we progress through Summer and into Fall. For sellers, that’s another punch to the gut. For buyers, it could mean there are deals to be had and that could be just enough incentive to nudge them off the fence and keep the wheels churning. Source: NWMLS. Though some figures were compiled independently and were not published by the NWMLS. The condo market is not good here in Kansas City. I have a million dollar listing in one building where there’s 40+ listings on the market and just 3 sales in the past 12 months. Making matters worse, all three of those sales sold for 30 to 50% off list price. 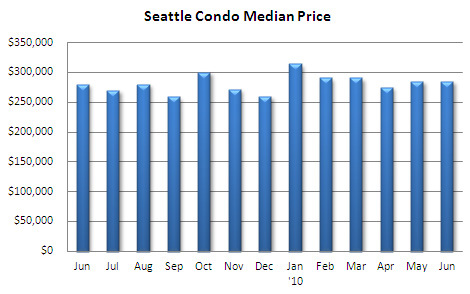 Just not enough condo buyers at this time. Wow, Downtown/Belltown took a beating in values. Here in Maui values have decreased slightly year over year, but have had increases in the high-end sector (including a record breaker for a condo). Subscribing to your blog. Same way here in Roy Utah area. 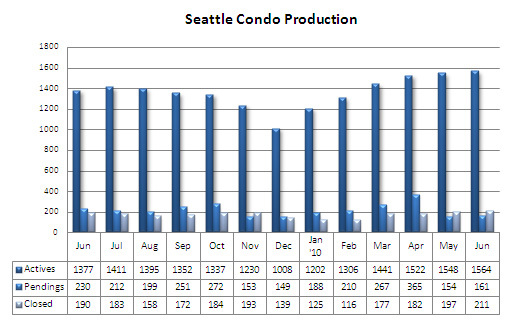 Condo sales in the last three months were way below both in monthly and yearly levels comparison. 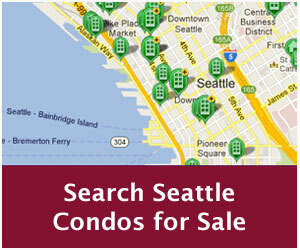 An average of 10 percent decrease in condo sales in the last three months. Hopefully, condo sales will recover this month.